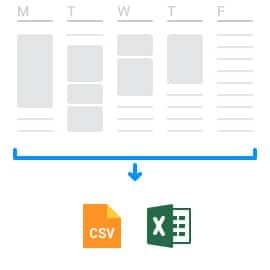 Filter your data for time periods, activities or tags and export it as CSV or Excel file with two click. Currently, we offer the following integrations: Toggl, JIRA, Harvest, Google Calendar, Outlook Calendar and iCal. Receive a weekly report via email giving you detailed insights into how you spent your time. Can I upgrade and downgrade between the Basic Plan and Pro Plan? Yes, you can easily downgrade from the Pro to the Basic Plan before the renewal date at the end of the prepaid period (6 months for the Monthly Pro Plan and 12 months for the Yearly Pro Plan). If you decide to cancel, we will downgrade your account to the limited Basic version. None of your data will be lost when you downgrade your account. You can also upgrade from the Basic Plan to the Pro Plan at any time. You will then start paying the monthly subscription fee to use the Pro features. What is the difference between Monthly, Yearly and Lifetime Pro? For the yearly Pro plan, you pay for the first 12 months upfront and the subscription will then renew on a yearly basis. By paying yearly, you will save 22% of the software costs per year. For the monthly Pro plan, you will get charged for the first six months upfront. Afterwards, the subscription will be automatically renewed on a monthly basis until you cancel it. Can I try the software before buying? Yes! You can download our free software here. From within the app, you can start your free Pro Trial or you can upgrade to the Pro version by following this link. Which integrations can I use with the Pro Plan? Currently, we offer the following integrations: Toggl, JIRA, Harvest, iCal, Google Calendar and Outlook calendar. To see what we’re currently working on and to vote on new features and integrations, please check out our Public Roadmap. Your data will be processed and stored in a DIN ISO/IEC 27001 and PCI DSS 3.2-certified data center. The DIN ISO/IEC 27001 is an internationally acknowledged IT-security norm. Didn’t find what you were looking for? Try our help center.